I have extended my regular programme of surgeries for my constituents and these come into effect from Monday 27 August 2012. 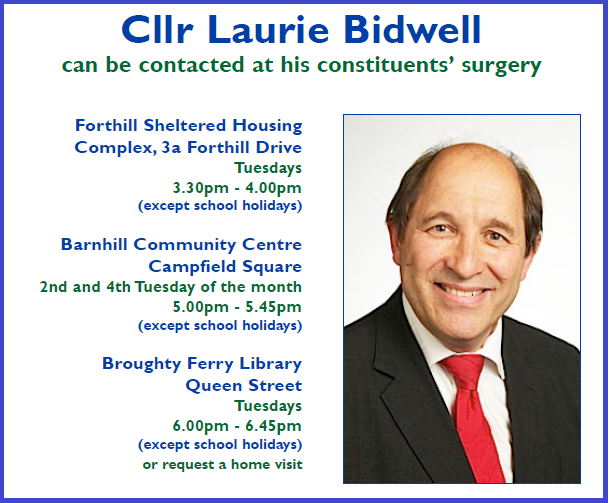 I have added a new weekly surgery at the Forthill Sheltered Housing Complex on a Tuesday afternoon beginning at 3:30 pm. I have also added a surgery at the Barnhill Community Centre on the second and fourth Tuesdays of each month beginning at 5pm. I also confirm that I am continuing with my weekly surgery at the Broughty Ferry Library but this will now begin at 6pm. You can read full details of my new surgeries and my contact details in the poster displayed. I think it's important that I am available to my constituents on a regular basis. It is also important, in a large ward like The Ferry, that I am available to constituents in different parts of the ward and I have tried to do this through the premises where I have located my surgeries. However, the shortage of suitable premises in West Ferry, Panmurefield, Balmossie Brae, Ferry Fields and Clearwater Park means that not everyone can have a surgery in their neighbourhood. I am also aware that many problems and issues can't wait for one of my surgeries, I am therefore very happy to hear from constituents by phone, letter or email. It is important to me as a Councillor to hear the views of people in Broughty Ferry and respond as quickly as possible. If you think that I can be of any assistance please do not hesitate to get in touch with me.